The nucleus of the cell serves to maintain, regulate, and replicate the critical genetic information encoded by the genome. Genomic DNA is highly associated with proteins that enable simple nuclear structures such as nucleosomes to form higher-order organisation such as chromatin fibres. The temporal association of regulatory proteins with DNA creates a dynamic environment capable of quickly responding to cellular requirements and distress. The response is often mediated through alterations in the chromatin structure, resulting in changed accessibility of specific DNA sequences that are then recognized by specific proteins. Anti-cancer drugs that target cellular DNA have been used clinically for over four decades, but it is only recently that nuclease specific drugs have been developed to not only target the DNA but also other components of the nuclear structure and its regulation. In this review, we discuss some of the new drugs aimed at primary DNA sequences, DNA secondary structures, and associated proteins, keeping in mind that these agents are not only important from a clinical perspective but also as tools for understanding the nuclear environment in normal and cancer cells. Numerous alterations in the nuclear environment occur in the development of cancer. In the past several decades, a major focus of cancer research has been discovering and understanding these tumourigenic events. These include small-scale changes in DNA sequences such as point mutations; larger scale chromosomal aberrations such as translocations, deletions, and amplifications; and other changes affecting chromatin structure including aberrant DNA methylation and histone modification. In all cases, these alterations can have dramatic direct effects on general nuclear activities, including DNA replication and repair, or on more specific activities such as the expression of key growth regulatory genes. Coincident with understanding tumourigenesis has been the development of agents to treat patients with cancer. The current focus in anti-cancer drug design attempts to mimic the uniqueness of the cancer with appropriate therapy, in the expectation that treatment regimes will become increasingly specific for the cancer type and less deleterious to the overall health of the patient. The goal of this review is to discuss some of the current strategies that specifically exploit our increasing knowledge of the nuclear environment in cancer cells to target specific cell classes for death. Anticancer drugs that target DNA have been used in the clinic, with varying degrees of success, for more than 40 years. These compounds vary in the type of chemical interaction with DNA, the degree of sequence selectivity, the extent of lesion reversibility and/or ability to be repaired, and cancer cell susceptibility to their action. 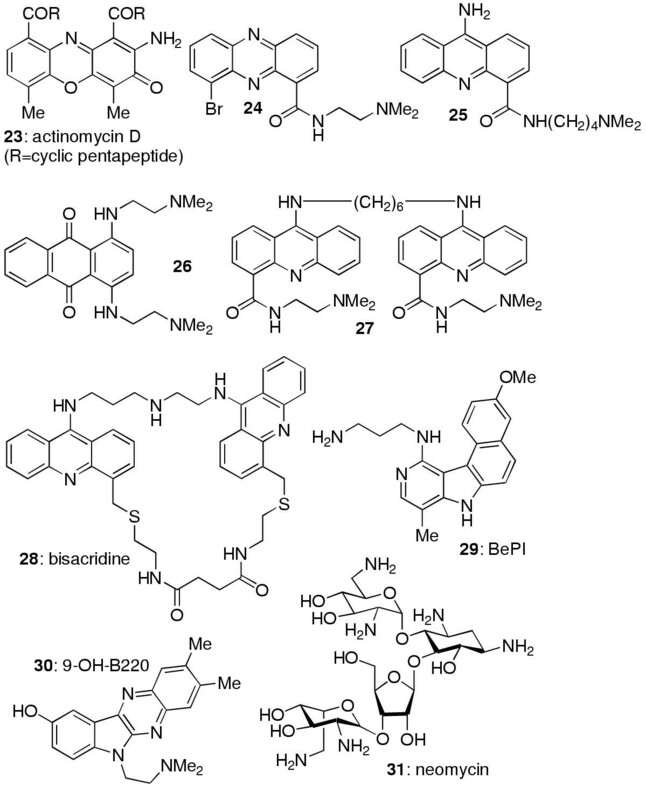 Classical DNA binding drugs have been considered as non-specific cytotoxic agents, with most of their therapeutic effects due to cytokinetic differences between normal and cancer cells. More recently, DNA interacting agents are being designed to affect specific nuclear functions, through interaction at designated primary DNA sequences, genomic locations, DNA secondary structures, or DNA-associated proteins. The effects of DNA interacting drugs within cells can be experimentally observed at many different levels (Figure 1). The first, most basic level, is the chemical interaction of the drug with the DNA double helix. A variety of techniques have been developed to examine this level of interaction, and have shown that the chemistry of the interaction is very similar if studied on naked DNA or in cells in culture. Alkylation at specific sites and sequences in cells can be examined by using a modified thermal cleavage assay. Following reaction of cells with the DNA alkylator, genomic DNA is extracted and heated to induce breaks at alkylation sites. The frequency of breaks can be ascertained by measuring the presence of modified nucleotide residues using HPLC or mass spectrometry. Time course experimentation can be performed to determine how the DNA adduct is maintained in the context of the nuclear environment. The site of alkylation and preferred sequence can be examined in cells using PCR stop assays wherein the DNA adduct prevents Taq polymerase elongation, or by ligation of the broken DNA with linker DNA molecules, followed by site-specific PCR and analysis of recovered products [3–7]. Compounds that bind tightly but reversibly to DNA can be analysed for their binding sites by footprinting assays, where short, defined DNA sequences (100–400 bp) are treated with random DNA-breaking agents in the presence of the compound, which protects from cleavage at its preferred binding sequences. This technique has been extensively used to study minor groove binding drugs such as distamycin A and the bis(benzimidazole) Hoechst 33258 [8–12]. Levels of Drug/DNA Interactions: A) The first level of interaction is the direct drug interaction with the DNA. Drug binding frequency and sequence preferences are two examples of evaluations of this level. B) The second level involves the disruption of DNA interactions with other molecules that result from the drug/DNA interaction such as DNA/protein interactions. Another possibility (not shown) is the alteration or stabilization of DNA secondary structures. C) The third level is the changes in nuclear activities such as transcription, replication, and repair or disruption in complex ternary structures. Green circles, drug/DNA adduct; black lines, DNA strands, chromosome (with loops); yellow oval, red oval, and pink circle, DNA associated proteins; blue square, protein modification such as phosphorylation or methylation. Chemical Structures 1–8. 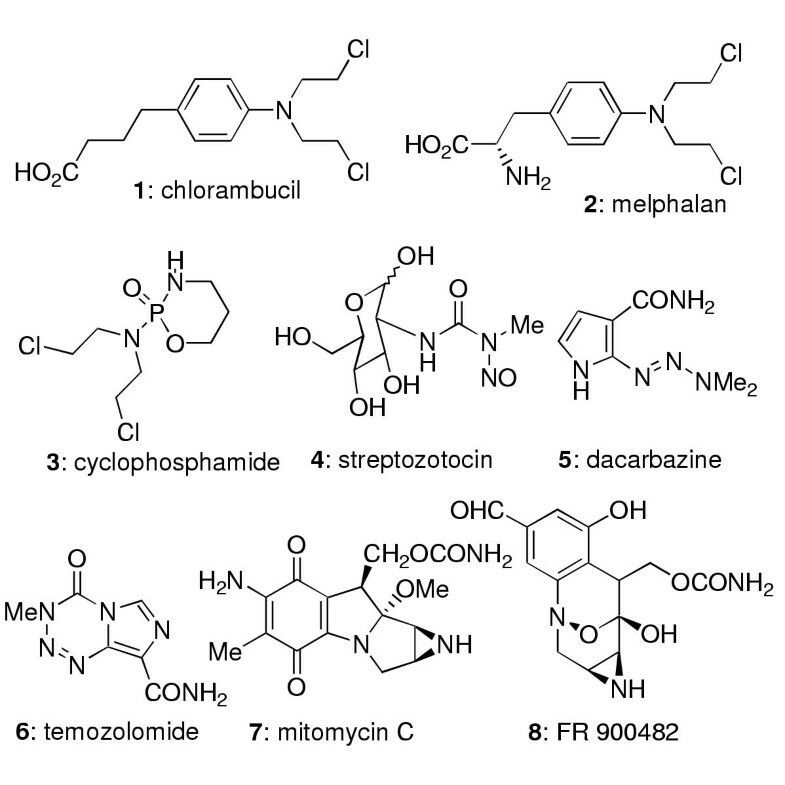 The Chemical Structures of chlorambucil, melphalan, cyclophosphamide, streptozotocin, dacarbazine, temozolomide, mitomycin C, FR 900482. Compounds are referred to in text by number in [#]. Chemical Structures 9–13. 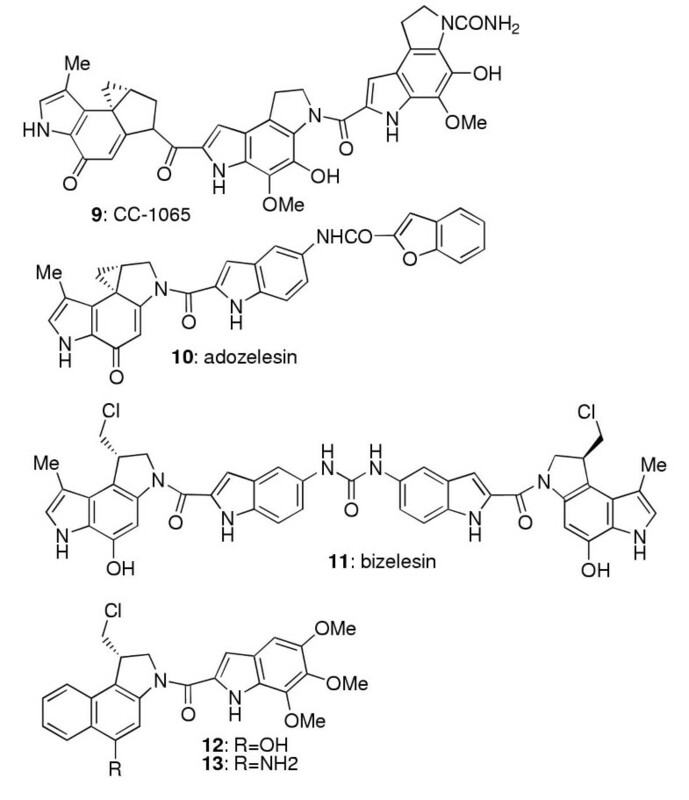 The Chemical Structures of CC-1065, adozelesin, bizelesin, and the aminoindoline compounds  and . Chemical Structures 14–18. The Chemical Structures of tallimustine, distamycin A, , Et-743, and phthalascidin. A second degree of interaction is the disruption of DNA/protein or other nucleic acid interactions (such as important DNA secondary structures) that result from the drug/DNA interaction. Transcription factors, chromatin-associated proteins, and proteins involved in replication, recombination and repair are examples of proteins that recognize aspects of the DNA double helix (major versus minor groove, B versus non-B form DNA), certain DNA sequences and regions, or other DNA modifications, all of which could be affected by drug binding. The drug/DNA interaction might stabilize a transient DNA structure, introduce a new conformation or structure, or mask a DNA modification and in these ways alter the normal regulatory processes working at these sites [13–15]. Some of the proteins that have been examined include the high mobility group (HMG) proteins [16–20]. These chromatin-associated proteins induce DNA bending, recognize distorted DNA structures, and play a role in regulating gene expression, repair and recombination. Electromobility shift assays (EMSA) [21–25] and chromatin immunoprecipitation (ChIP) [26–30] are some of the methods used to assess DNA/protein interactions in vitro and in vivo. Expression microarrays and real-time reverse transcriptase PCR can be used to assess changes in transcription of genes in the presence of DNA-binding compounds, a likely end product of alterations in protein/DNA binding. Indeed, transcription of 21 genes with promoters containing match sites for the minor groove-binding hairpin polyamide/chlorambucil conjugates were significantly inhibited in the presence of these compounds. DNA secondary structures, such as those that form during DNA recombination, or G-quadruplexes found at the ends of chromosomes and sometimes present within regulatory regions of genes, are other examples of possible targets for drug design. Several recent reviews have discussed some of these structures and their relevance for targeting[13, 31, 32]. Techniques that are used to investigate these DNA structures, their orientation and polarity, and stability in vitro include CD, IR, and NMR spectroscopy, X-ray crystallography, and molecular techniques such as native gel electrophoresis, chemical probing of isolated DNA species with nucleotide-specific cleavage reagents, PCR and primer extension reaction stop assays [33–37]. More global changes in the nuclear environment can be visualized using a combination of fluorescence in situ hybridization (FISH) and confocal microscopy techniques,"ImmunoFISH", a relatively new technology that allows coincident visualization of protein complexes and DNA in intact nuclei[38, 39]. This type of microscopy enables visualization of nuclear complexes composed of DNA and protein, such as nuclear factories, the nuclear matrix attachment sites and organizational centres for processes of DNA replication and transcription. Alterations in these complexes that result from drug treatment might not be detected using other molecular techniques. This technology is particularly useful for examining the nuclear distribution of specific genomic locations or sequences which might change during the course of the cell cycle. For instance, this technique has recently been used to examine distribution and binding of membrane Tel binding protein (MTBP/TRF2) to telomeres during spermatogenesis and the cell cycle. Deconvolution microscopy using fluorescently-labelled polyamide compounds has also been used to monitor drug uptake and cellular distribution . These technologies will undoubtedly provide insight into the global effects of drug treatments and aid in future drug design. The DNA primary base sequence is the simplest level of complexity governing the genetic code. However, its importance in regulating nuclear processes should not be underestimated, despite the inability to always predict outcomes based on observed patterns. For example, the consensus sequence for a given transcription factor in a promoter region does not necessary mean that protein is constitutively bound to that site. It is because of this unpredictability that the more complex nature of genomic DNA is considered in later sections of this review. We have divided the discussion of DNA primary base sequence into four sections in order to introduce the types of anticancer drugs that interact with DNA. These include non-specific interactions and sequence-specific interactions with repetitive DNA, AT-rich DNA, or stringent consensus binding sites. The structures of the compounds vary as well as the way in which they interact with DNA. It is important to realize, however, that clear distinctions between these groups do not always exist. One of the key observable differences between many types of cancer cells and normal tissues is that the former divide more rapidly. Treating cells with DNA damaging agents should perturb the cancer cell's ability to divide. The way in which this is achieved is determined by the type of DNA lesion, as well as the genetic makeup of the cell. From the point of view of cancer treatment the desired pathway is induction of cell death, as DNA repair can lead to the generation of mutations if the repair is not accurate. If a DNA lesion is not repaired prior to approach of a replication fork either by transcription coupled repair or global repair pathways, the replication fork will stall. A variety of signals are then sent out by the stalled fork so that the lesion is either repaired or bypassed, initiation of other replication origins is inhibited, and possibly apoptosis is induced [42–44]. Inducing apoptosis in anti-cancer therapy is not as straightforward as one would expect. The two major apoptotic pathways are the external death-receptor-induced pathway (which involves ligands and receptors, for example, FAS and TNF) and the mitochondria-apoptosome-mediated pathway, which is intrinsic and induced by insults such as chemotherapy and radiation . Intrinsic programmed cell death is dependent on the activation of cellular checkpoint proteins. In the case of DNA damage, sensing proteins, such as RAD9, RAD1, RAD17, and HUS1, relay the damage signal to signal transducers (Mek1, ChK1, Rad53 in yeast; ATM, ATR, ChK1, and ChK2 in mammals) and effectors (p53, BRCA1, repair proteins, etc) . In mammals the story is not as clear as it is in yeast, although many mammalian homologues of the yeast proteins have been identified. Other protein complexes may play roles in damage sensing such as the BRCA1-associated genome surveillance complex which includes BRCA1, ATM, the MRE11-RAD50-NBS1 (MRN) complex, MSH2/6 and MLH2 mismatch repair proteins, and Bloom's helicase. Activation of the damage response pathway can lead to arrest of cells at various stages in the cell cycle, induction of DNA repair, and activation of specific gene expression, as well as apoptosis. P53 is an important G1 checkpoint protein that prevents passage of the cells into S-phase via transactivation of the cyclin-dependent kinase (CDK) inhibitor, p21waf1/cip1 [48, 49] but also plays a role in other cell cycle checkpoints. Other examples of proteins involved in the G1/S checkpoint include Rb-E2F pathway, G1 cyclins, and the ARF proteins[46, 48, 49]. The S-phase checkpoint involves ATM, ATR, ChK1 and ChK2 proteins [50–54] and leads to inhibition of initiation of replication at origins and stalling of replication forks. How this checkpoint manifests in upper eukaryotes is not entirely clear although in yeast, when a lesion is encountered by a progressing replication fork, replication protein A (RPA) binds to the single stranded DNA about the lesion which in turn recruits the Mec1/Dcd2 sensing complex (Mec1 is a homolog of mammalian ATR and ATM). This sensing complex associates with Rad24/Rfc2-5, and Rad53 (Rad53 is the ChK2 homolog) is then recruited and activated by phosphorylation in a Mec1 dependent manner [42, 55]. In mammals, the DNA damage signal is sensed by ATM and ATR proteins and propagated directly or via the ChK1 and ChK2 kinases to downstream effectors including p53, BRCA1, Mus81 and CDC 25 . It should be noted that the exact roles these damage response proteins play in yeast and mammalian cells is not necessarily the same. ATM has also been shown to phosphorylate the Nijmegen breakage syndrome gene (NBS-1) in vitro and in vivo in mammalian cells in response to γ-irradiation . NBS-1 is a component of the MRN complex which is involved in recombination and repair, and thus provides a direct link between the checkpoint proteins and DNA repair. BRCA1 has also been shown to be phosphorylated in an ATM-dependent manner following DNA damage and to bind to the MRN complex [57–59]. Induction of apoptosis involves activation of signalling pathways that often shift the balance from anti-apoptotic proteins to pro-apoptotic proteins, leading to cell cycle arrest and activation of caspase enzymes. The apoptotic cell is characterized by loss in cell volume, membrane blebbing, nuclear condensation, chromatin aggregation and endonucleolytic DNA fragmentation . A variety of techniques can be used to analyze apoptosis, including flow cytometry (annexin V labelling of externalized phosphatidylserine, caspase activation using fluorescently labelled caspase inhibitors, and PI-staining DNA content analysis), microscopy (morphological changes) and gel electrophoresis (DNA laddering). In most cases more than one method is employed to clearly define the apoptotic process. This is particularly important when studying induction of apoptosis in cancer cells compared to normal cells, because expression of growth factors, tumour suppressor proteins and other cell cycle inhibitors is deregulated leading to unexpected outcomes in these classical apoptosis assays. In addition, different cell types may not activate all the pathways that result in the apoptotic cell phenotype. The first drugs to be used to treat highly proliferative cancers were the relatively non-specific nitrogen mustard DNA alkylating agents such as chlorambucil , melphalan , and cyclophosphamide . These form monoadducts primarily at any G-N7 site in the major groove. However, the biologically important initial lesion formed by mustards in cells is interstrand cross-links, primarily at 5'GPuC sequences. There is also evidence that they cause termination of transcription . Cyclophosphamide is the most widely used mustard clinically, and is a non-specific prodrug of the active metabolite phosphoramide mustard, requiring enzymic activation by cellular mixed function oxidases. The (necessarily) high chemical reactivity of mustards leads to rapid loss of drug by interaction with other cellular nucleophiles, particularly proteins and low molecular weight thiols. This results in the development of cellular resistance by increases in the levels of low molecular weight thiols (particularly glutathione) [62, 63]. Of equal importance for efficacy, much of the drug can reach the DNA with only one alkylating moiety intact, leading to mono-alkylation events which are considered to be genotoxic rather than cytotoxic. The fact that cross-linking is a two-step process adds to the proportion of (genotoxic) monoalkylation events, since the second step is very dependent on spatial availability of a second nucleophilic DNA site. Because of their genotoxicity, there is a risk of the development of second cancers from their mutagenic effects, with the most frequent alkylator-induced malignancy being acute leukemia, usually occurring a long period (3–7 years) after treatment. Another class of even less selective alkylating agents is those which break down to very unstable intermediates that react indiscriminately. These include nitrosoureas such as streptozotocin , which has been used as a component of multi-drug protocols for Hodgkin's disease , and triazenes such as dacarbazine , widely used for malignant melanoma, and the more recent temozolomide , used increasingly for gliomas . Mitomycin C  is an example of a more complex and sequence-specific DNA cross-linking agent. It is widely used clinically, perhaps most effectively now in bladder cancer , but its use is limited by myelosuppressive side-effects. The mitomycin C-related FR family of antibiotics, including FR900482  and related compounds, are compelling potential replacements which may in some cases offer decreased toxicity[26, 27]. The FR family of compounds undergo reductive activation to form reactive mitosene derivatives, which crosslink DNA preferentially at 5'CpG'3 steps. Although generally considered a non-selective agent, there is some evidence that mitomycin and related compounds have shown some selective effects in cells. Using a modified ChIP assay with Jurkat T cells, FR900482 was shown to crosslink regions in the IL-2 and IL-2Rα promoters and the HMG I/Y, HMG 1, and HMG 2 minor groove binding proteins and not the major groove binding proteins (with overlapping DNA target sequences), Elf-1 and NFκB. We now know that the human genome contains considerable areas of repetitive DNA sequences [70, 71]. These are generally organized in heterochromatin, mainly in centromeres. These satellites consist of repeat units of several thousand base pairs. Minisatellites (also called variable number tandem repeats) and microsatellites (also called short tandem repeats) are distinctly different from satellites in that the repeat units are shorter and less complex, and they are dispersed across the genome. The difference between minisatellites and microsatellites is the latter repeat length is between 1 and 13 bp whereas the minisatellite is longer. In some cases mini- and microsatellites may serve important regulatory functions. For instance, a vast majority of the CGG trinucleotide repeats are located in the 5' untranslated regions of genes and are oriented with respect to the transcribed strand such that the mRNA contains the repeat. In addition, repetitive DNA often has the ability to take on non-B form DNA conformations which might recruit certain regulatory proteins that participate in control of gene expression. "AT-islands", containing between 85–100% AT, are distinct minisatellite regions[3–6, 15]. These islands consist of between 200 to 1000 bp of repetitive DNA. A number of critical nuclear processes are organized around AT-rich DNA sequences in the genome. In some instances, these islands function as matrix attachment regions (MARs) that organise DNA loops on the nuclear matrix and coordinate nuclear activities such as DNA replication, transcription, and mitosis. Nuclear matrix binding ability of DNA sequences can be demonstrated in vitro by preparing nuclear matrices and incubating with labelled DNA probes of sequences of interest and unlabeled competitor DNAs (either non-specific or MAR containing), followed by gel electrophoresis of washed matrices. In vivo MAR binding activity can be assessed by digestion of nuclear DNA with a number of enzymes that do not cleave within the potential MAR, followed by nuclear matrix preparation to separate the matrix-associated DNA from loop DNA. Labelled probes are then used to screen dot blots of prepared matrices and associated DNA. Enrichment of DNA sequences within the nuclear-matrix fractions versus loop DNA fraction is highly suggestive of MAR activity. Repetitive sequences, like these "AT-islands", are notoriously unstable elements with changes occurring either through polymerase slippage or unequal recombination. The types of rearrangements that often occur at these sites include expansion and deletion of the repetitive elements. Not surprisingly, mini- and microsatellite instability features in a number of human diseases and cancers, such as human colorectal cancer and a variety of leukaemias and lymphomas. Using a variety of experiments including in vitro and in vivo MAR binding assays, Jackson et al have recently demonstrated that the AT-islands within the FRA16B fragile site are expanded and preferentially associated with the nuclear matrix in the CEM leukaemia T cell line as compared to normal WI-38 fibroblasts. This alteration in the organization of DNA in the leukaemia cell line correlates with a hypersensitivity to drugs which specifically alkylate in repetitive AT-rich regions [4, 6, 15]. Origins of replication and various promoter sequences are other examples of AT-rich sequences. Unlike simpler eukaryotes, mammalian origins of replication are not as clearly defined or localized on individual chromosomes. Sites have been identified however, such as the c-MYC origin that lies in the 5' region of the gene. This site is AT-rich although the c-MYC MAR located in the 3' region of the gene has a significantly higher AT content. Destabilization of these regions would undoubtedly affect the cell's ability to initiate DNA synthesis, although the impact this would have on cellular proliferation is not necessarily predictable. Genetic changes associated with instability could also affect gene expression. Many genes have been identified that contain mini- and microsatellites of all sorts, expansions or other alterations of which have been implicated in deregulation and association with disease[70, 71]. Examples include the CAG repeat in the Huntington's gene, the G/C rich repeat 600 bp upstream of the insulin gene ATG (insulin-dependent diabetes mellitus), the GAA repeat in the X25 intron associated with Friedreich's ataxia, and the G/C rich repeat downstream of the HrasI polyA signal, certain alleles of which are associated with increased cancer risk. The metabolic processes at AT-rich minisatellites may be directly affected by drug-induced DNA lesions and/or hindered by the induction of cellular checkpoints and DNA damage response pathways. For example, drugs that interact specifically at such sites could interfere with essential protein/DNA interactions that then lead to delay in or inhibition of DNA synthesis or deregulation of gene expression. Drug interference could result from competition for factor binding to the sequence, deletion or alteration in the DNA sequence as a result of repair processes, and/or distortion in the local DNA confirmation[14, 15]. The cyclopropyindoline compounds, including the natural product CC-1065[73, 9] and related synthetic analogues like adozelesin  and bizelesin , are extremely cytotoxic DNA alkylators that target the N-3 of adenine in the minor groove of AT-rich DNA sequences. Even simpler analogues such as the hydroxyl- and aminoCBI compounds  and  show very similar patterns of DNA alkylation when compared on a section of the gpt gene, alkylating preferentially at 5'-A(A/T)AN sequences, although the amino analogue was the more efficient alkylator, and showed similar levels of potency in a variety of cell lines. A comparison of the monoalkylating derivative, adozelesin, and the related bifunctional analogue, bizelesin, showed that while both are highly AT-selective, the latter requires a target site with adenines spaced six base pairs apart, and most commonly alkylates by crosslinking adenines very preferentially at T(A/T)4A sites. Monoadducts have also been observed at A(A/T)4A sites, although to a lesser extent [3, 4, 76]. In silico drug/DNA binding analysis predicts that the bizelesin binding motif occurs approximately 2.8 times every 250 bp. AT-island hotspots are present once every 106 bp, and within these hotspots bizelesin sites occur 99 times every 250 bp. These long AT-islands are suspected to be the major targets for bizelesin binding and responsible for its high toxicity. Using a model AT-island DNA, actual bizelesin binding sites were determined and confirmed the in silico predictions. Bizelesin was 100 times more reactive with the model AT-island DNA than the non-AT-island model[6, 15]. 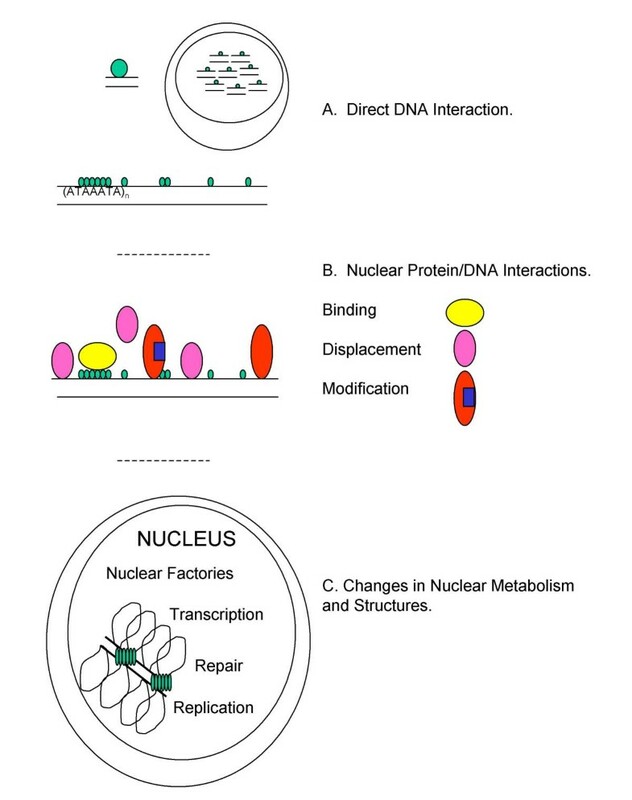 Woynarowski in a recent review has suggested that the potent cytotoxicity of the general indoline class of toxins is caused by disruption in critical nuclear processes that are organized around functional AT-rich DNA sequences in the genome. Matrix attachment regions, origins of replication, and candidate promoters are examples of AT-rich sequences that might be specifically targeted by these compounds as a result of their alkylation preference and sequence specificity. Furthermore, hits to AT-rich sequences by the region-specific AT binding drugs such as bizelesin or other AT-specific drugs like tallimustine that are not organized in these regions would be much less deleterious to the cell because of a lack of functional consequence. The variation in cytotoxic potencies of different indoline analogues and other AT-specific drugs could result from the ability to target these regions effectively. The degree of susceptibility of a cancer cell to these agents may depend on a number of additional factors including deregulated gene expression and genomic instability, and in this way these compounds may be more specifically toxic to cancer cells. Woynarowski and co-workers have found that the AT-rich fragile sites Fra16B and Fra16D, and the c-MYC origin, a region commonly amplified in cancer cells, are targeted by bizelesin. In addition, we have found that 50% of the recovered mutations in the gpt gene of surviving AS52 Chinese hamster ovary cells treated with aminoCBIs are deletions in AT-rich regions (unpublished). Thus, specifically localized DNA damage can result from treatment with drugs of this class and may contribute to the potent cytotoxicity. Given the increased level of genomic instability in cancer cells, drug potency may be enhanced due to expansion of these satellite regions and/or because of deletions in these critical regions following drug treatment. CC-1065, bizelesin and adozelesin have been shown to inhibit DNA replication in cell-free and cell-based systems (yeast and mammalian) [77–82]; however, the mechanism of inhibition is not clearly understood. Based on the DNA/adduct distortion studies[83, 84], replication initiation may be inhibited by distortion of specifically targeted MARs resulting in a block in origin complex assembly necessary for proper origin firing. This could explain the very high lethality of bizelesin (<10 adducts per cell leads to inhibition of growth) compared to that for the AT-specific alkylator tallimustine  (>200 per cell) and conventional mustards (several thousands per cell) which do not demonstrate region-specific DNA binding. Another reason why selective damage to AT-rich DNA might be important in the mechanism of drug action is that binding to these sequences affects specific gene expression. This may arise by preventing transcription factor binding, increasing the affinity of a transcription factor for its sequence, or creating unnatural binding sites. For example, CC-1065 has been shown by EMSA to inhibit TATA Box Binding protein (TBP) from binding to a DNA oligonucleotide containing the adenovirus major late promoter TATA box sequence. In this case, drug binding was thought to directly hinder minor groove binding of TBP to the TATA box. Binding of Specificity Protein 1 (SP1), a member of the SP/KLF family of transcription factors, to 6 GC boxes present in the simian virus 40 (SV40) early promoter is also inhibited by CC-1065 binding to AGTTA* between the SP1 sites, where * indicates the site of covalent modification. These authors propose that the inhibition in SP1 binding, particularly at the 3'-GC box, resulted from distortions in the DNA caused by adduct formation. High-field NMR studies of the adozelesin/DNA adduct have confirmed that drug binding distorts the DNA double-helix despite maintaining normal Watson-Crick base pairing. AT-rich sequences found in regulatory regions in other genes associated with cancer, such as c-MYC, have also been identified as sites specifically alkylated in cells treated with related compounds. Using a similar approach (real-time PCR stop assay) we have found that the aminoCBI compounds also target AT-rich sites located within the c-MYC gene in cell culture, and furthermore using real-time reverse transcriptase PCR analysis, we have found that c-MYC expression rapidly (within a few hours) decreases following treatment (unpublished). We are currently extending these studies to look at changes in protein expression levels. There are several drug classes that are able to span DNA and recognise a limited number of specific sequences. The most discriminatory sequence selective DNA binding compounds to be developed are the pyrrole-imidazole (Py-Im) polyamides[10, 86, 87]. These minor groove binding compounds are synthetic ligands that were developed based on the binding properties of the AT base selective drug distamycin A [15, 88]. The dimeric hairpin Py-Im polyamides derivatives have been shown to inhibit transcription factor binding, such as TBP, NFκB, and ETS-1, to recognition sequences in vitro [89–91]. Another recent study demonstrated that Py-Im polyamides can derepress expression of the HIV long terminal repeat by inhibiting host factor LSF binding to the repressor complex sequence in the context of host cell chromatin . Despite successful inhibition of transcription factor binding to naked DNA, the hairpin polyamides have not proved to be effective at inhibiting gene expression in cells. A new approach is to conjugate polyamides with DNA alkylating agents such as chlorambucil (Py-Im-Chl) , in the expectation of increasing their biological potential and hence therapeutic use [91, 93, 94]. These derivatives were shown to inhibit in vitro replication of SV40, mammalian cell growth, and genomic DNA replication, and cells treated with Py-Im-Chl conjugate arrested in G2/M. More detailed analysis of the accessibility of nuclear chromatin and effects on gene expression have been performed using the Py-Im-Chl conjugate by Dudouet et al.. Using ligation-mediated PCR to examine alkylation sites, these investigators found that the Py-Im-Chl conjugate was capable of accessing target binding sites in the HIV-1 enhancer and promoter in lymphoid cells. Microarray analysis of cellular expression profiles indicated that a limited number of genes (21 genes using 2 conjugates) were affected by polyamide-conjugate treatment, and that in each case match sites were located within the 5'-flanking region of the gene. While it is still not known how effective these agents will be clinically, it is very promising that the expression of so few genes can be altered considering the number of potential polyamide binding sites for these agents within the entire human genome (experimentally determined to be approximately 1 in 1900 bp, expected frequency calculated to be present 1 in 2048 bp). Et-743  is a minor groove alkylating agent which was originally isolated from the sea squirt Ecteinascidia turbinata, and is currently in clinical development [95, 96]. Alkylation by Et-743 of the N2 of the central guanine of the DNA binding triplet results in a conformational change in the DNA, with the minor groove widening and the double helix bending towards the major groove [97–101]. Et-743 does not have the same degree of DNA sequence specificity as the polyamide compounds. However, this compound does demonstrate a unique potential to alter gene expression of discrete loci based on the presence of GC boxes in the promoter regions. The potent cytotoxicity of Et-743 is thought to be due to inhibition of transcription factor binding, resulting in effects on transcription. For example, DNA binding of NF-Y to the CCAAT box and the transcriptional activation of MDR1 and HSP70 (genes regulated in part by NF-Y via the CCAAT motif) are affected by Et-743 [102–104]. Interestingly, constitutive expression of MDR1 and HSP70 is not affected; therefore, Et-743 may work via inhibiting activated transcription in response to certain stimuli. Microarray analysis of tumour cell lines treated with Et-743 and phthalascidin  (Pt 650), a synthetic analog of Et-743, showed similar changes in gene expression including a decrease in expression of genes which bind to CCAAT-boxes which might contribute to the repression in activation of transcription of MDR1 and HSP70 [105, 107]. Et-743 also inhibits the transcription of other genes, including c-FOS, c-JUN, E2F1, H2B, and H4. The mechanism is presumably by alkylation of the guanine bases in the GC boxes present in the promoter regions, resulting in a block in the binding of transcription factors such as NF-Y, SP1 and ERG1.In vitro inhibition of the transcription factors TBP, E2F, and SRF has also been observed. Modelling studies suggest that head to tail binding of three Et-743 molecules to DNA resembles an RNA-DNA hybrid complex, and that the distortions mentioned above mimic those induced by zinc finger transcription factor binding. These investigators have speculated that such changes in the DNA could not only inhibit factor recognition but also induce DNA/Et-743/protein interactions. Et-743 also seems to exert its cytotoxic effect on cells by inducing single-strand DNA breaks (ssDB) via an interaction with the transcription-coupled repair machinery, as cells resistant to Et-743 have defects in the xeroderma pigmentosum genes, and show reduced ssDBs following treatment[110, 111]. Mutations in the DNA double-strand break repair pathway, however, sensitize cells to Et-743 cytotoxicity. Taken together, these studies suggest that while inhibition of transcription factor binding to certain promoters is an important part of the Et-743 mode of action, the anti-tumour activity is also dependent on endogenous features of the cancerous cell such as certain DNA repair pathways. In the previous section of this review we discussed the biological impact of several different DNA-interacting compounds including the nature of their interaction with DNA, mechanism of action, and known anti-cancer activity. In addition to small molecules that interact with specific bases and base sequences, a number of compounds are being developed which target DNA secondary structures such as DNA tetraplexes and quadruplexes, hairpins, and Holliday junctions. Some of these DNA structures have been implicated in regulating numerous nuclear activities, and represent an exciting new area of research into potential anti-cancer targets as well as for treatment of numerous other human diseases including diabetes and neurodegenerative disorders. Telomeres are the repetitive DNA sequences (TTAGGG) at the ends of chromosomes that protect the 3' ends from degradation and inappropriate repair activities and interact with a number of different proteins forming the telomeric complex [113–115]. In normal proliferating cells, telomeres are shortened with each round of replication and telomerase expression is negligible. Eventually, telomeres become so short that they are no longer capable of protecting chromosome ends, leading to chromosome fusions and erosion. This results in the induction of "telomere-induced senescence" and loss of cell viability. In many cancer cells, however, a short telomere length is maintained during cell divisions in part because of increased telomerase activity. In fact more than 90% of all human cancers have increased expression of telomerase which is one reason why it has been suggested as a target for anti-cancer drug design efforts. In addition to the telomerase enzyme, the telomeric DNA structure is being examined for its ability to be targeted by anti-cancer treatments[114, 116–121]. Telomerase is a multi-component enzyme comprised of protein and nucleic acid. The two main components are the RNA moiety (hTER) and the catalytic subunit (hTERT), although there are several additional regulatory binding proteins (for example: HSP90, p23, and TEP1). There are numerous telomerase inhibitors in development. The main strategies include anti-sense oligonucleotides, peptide nucleic acids and ribozymes targeting the RNA component of telomerase, dominant negative versions of the hTERT subunit, small molecule inhibitors of the enzyme complex, and disruption of the G-quartet (see below)[120, 122, 123]. While decreases in telomerase activity have been achieved using these approaches, this has not necessarily led to reduced cancer cell viability. The G-quartets of the telomere (3' G-rich overhang of 150–200 bp that form the DNA secondary structure, the G-quartet) are stacked tetrads arising from planar associations of four guanines in a cyclic Hoogsteen hydrogen-bonding arrangement (Figure 5) . G-quartets can be stabilized by sodium and potassium ions, and this stabilization can inhibit telomerase activity. As such, the ability of small molecules to interact with and presumably stabilize these secondary structures as a means of inhibiting telomerase has been a major drug design effort. DNA Secondary Structures: G-Tetrad and G-quadruplex. 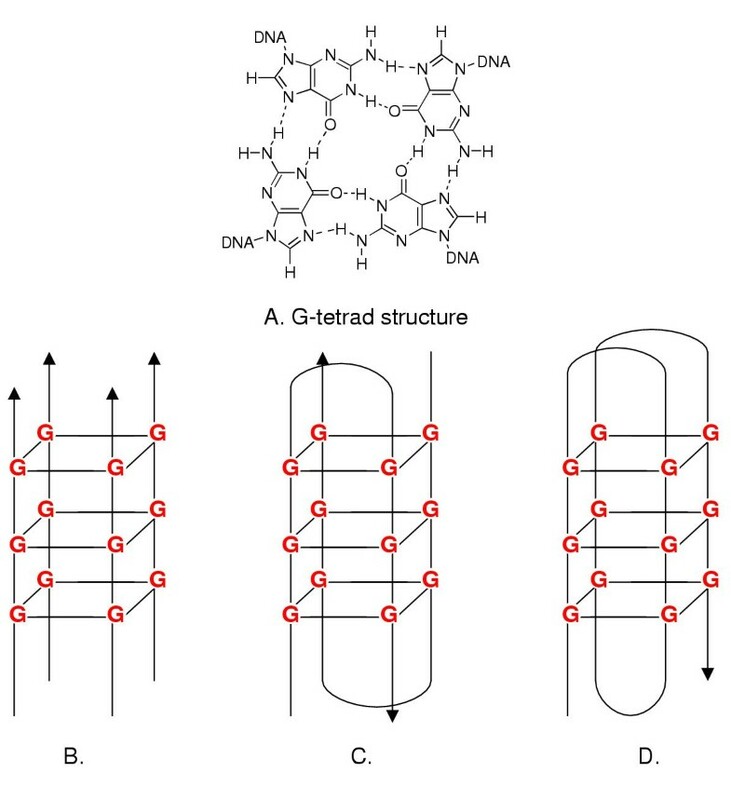 A) Schematic illustration of G-tetrad, four guanine bases in a planar arrangement through Hoogsteen hydrogen bonds; B) G-quadruplex, parallel arrangement of four DNA strands; C) Intermolecular G-quadruplex, DNA sequences with G-rich repeats forming hairpins that dimerize to stablize bimolecular structure; and D) anti-parrallel intramolecular G-quadruplex (fold-over G-quadruplex), single DNA strand with four G-rich repeats that can fold upon themselves to form the quadruplex structure (adapted from Han and Hurley ). Chemical Structures 19–22. The Chemical Structures of BSU-1051, , TMPyP4, and PIPER. Chemical Structures 23–31. The Chemical Structures of actinomycin D, [24-27], bisacridine, BePI, 9-OH-B220, and neomycin. Chemical Structures 32–35. The Chemical Structures of camptothecin, doxorubicin, etoposide, and fostriecin. Chemical Structures 36–40. 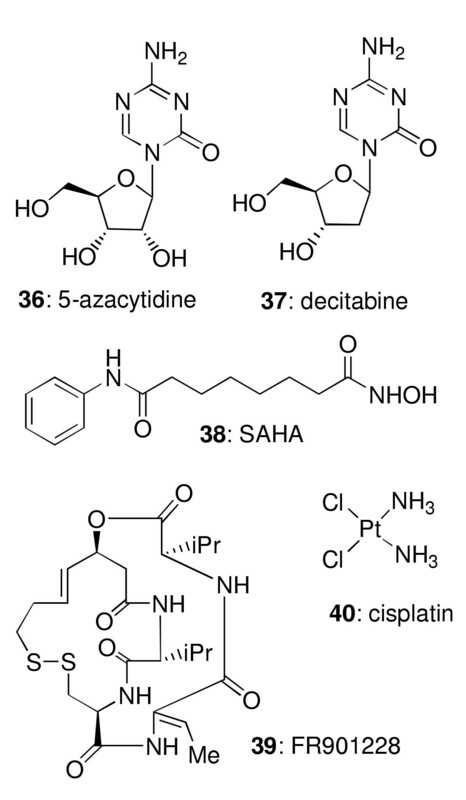 The Chemical Structures of 5-azacytidine, decitabine, SAHA, FR 901228, and cisplatin. A number of small molecules have been identified that interact with G-quartets. Molecular modelling studies of anthraquinones predicted these compounds would interact with G-quartets by a threading intercalation model . Nuclear magnetic resonance studies have confirmed that the 2,6-diamidoanthraquinone BSU1051  interacts with and stabilizes the G-quartet, and inhibits telomerase activity. A 3,6,9-trisubstituted acridine  was also a potent (IC50 18 nM) inhibitor of telomerase. In A431 human squamous cell carcinoma xenografts it showed a significant additional growth delay compared with paclitaxel alone, with no additional toxicity. Cationic porphyrins, exemplified by TMPyP4 , are another class of agents that were predicted to bind to G-tetrads by interactive stacking. Two independent research groups showed by a variety of methods (spectroscopy, CD, NMR) that these compounds do interact with parallel and anti-parallel G-quadruplexes[32, 128]. The way in which the compounds interact with the DNA is not entirely clear, but most likely involves external stacking of the porphyrins relative to the G-quadruplex. A third class of G-tetrad interacting compound is typified by the perylenetetracarboxylic diimide PIPER  that demonstrates similar binding attributes to the porphyrins. Interestingly these compounds may not merely bind to such DNA structures, but may also induce their formation in cells . In addition to telomeres, G-quadruplex sequence motifs have been identified in other regions of the genome, particularly in the upstream promoter regions of a number of oncogenes . Within the c-MYC promoter, the nuclease hypersensitive element III1 (NHE), corresponding to bases 2186–2212 in human c-MYC , has been known to play an important role in regulation of c-MYC expression. Insight into the regulatory nature of this region was first demonstrated when synthetic oligonucleotides with sequences complementary to the NHE c-MYC coding were capable of blocking c-MYC expression[132, 133]. Further in vitro studies using c-MYC promoter DNA demonstrated this region was capable of forming quadruplex structures (G-rich strand) and i-tetraplexes (C-rich strand) [34–36]. These latter structures are formed based on hemiprotonated cytosine+/cytosine base pairs containing three stabilizing hydrogen bonds between them. The four-stranded structure is composed of two parallel-stranded duplexes zipped together in an anti-parallel configuration [134–136]. In the case of the c-MYC promoter the formation of the G-quadruplex appears to be the biologically relevant structure. The use of G-quadruplex stabilizing compounds targeted at telomeres prompted the investigation of affects within the c-MYC locus. 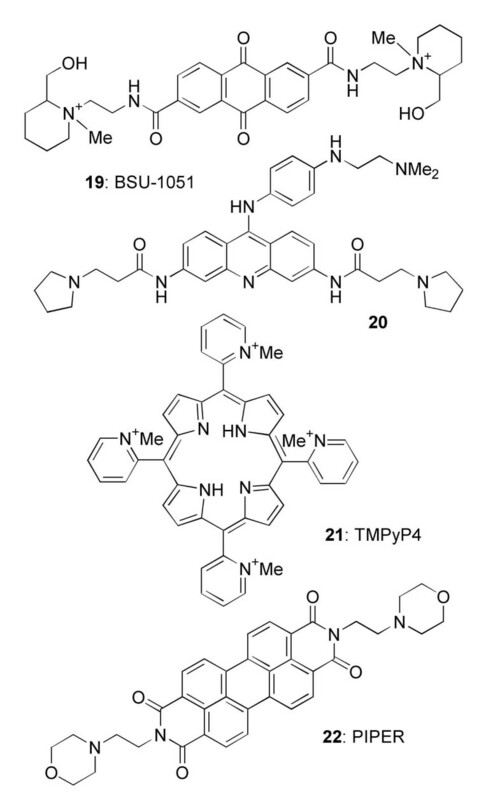 Using the cationic porphyrin, TMPyP4, Grand et al. (2002) and Siddiqui-Jain et al. (2002) have demonstrated repression of transcriptional activation of c-MYC in cells based on G-quadruplex stabilization. In addition, mutational analysis by replacement of a G to an A within this G-rich region which is predicted to destabilize quadruplex formation results in a 3-fold increase in c-MYC expression also points to a biological role for this secondary structure . A variety of secondary structures (hairpins, cruciforms) have now been detected in the genomic DNA of a number of prokaryotic and eukaryotic species, including humans. These structures are associated with regulation of gene transcription, possibly as recognition binding sites, and may be targets for selectively binding drugs that could either block or enhance transcription. Thus, the potent transcription inhibitor actinomycin D  and analogues bind at least 10-fold more tightly to the hairpin conformation formed from the single-stranded DNA 5'-A7TAGT4A3TAT7-3' than to same strand fully duplexed to its complementary sequence. 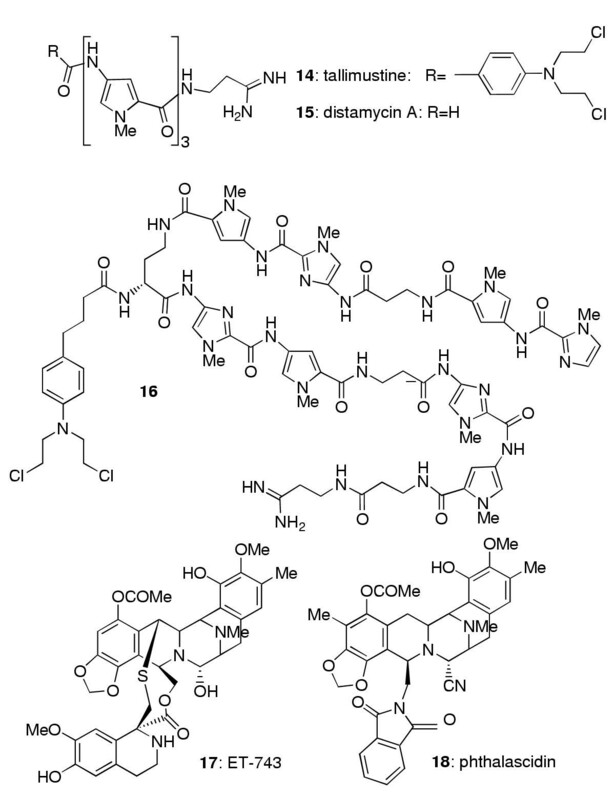 Similar results have been reported for actinomycin D binding to GC-rich hairpin sequences . DNA four-way junction structures (Holliday junctions), often created by mismatches, are known to occur during DNA replication, repair and recombination, making them potential targets for the development of novel antiviral and antibacterial agents. Human TOPO IIβ also binds preferentially to four-way junction DNA, suggesting that it might operate via such structures. It has long been known that some intercalating agents show preferential binding to such branched DNA sequences. Recently, a series of crystal structures of both mono-intercalators [24–26, 144–146] and dimeric drugs [27, 28, 144, 147], complexed with short oligonucleotides, have shown that the ligands can induce Holliday junction-like DNA structures. It remains unclear whether this reflects the situation in longer DNA. DNA duplexes of certain sequences can bind a third DNA (or modified DNA) strand, to form a triple helix. The third strand binds to the existing base pairs in a manner called Hoogsteen base pairing; T binds to A (but in a different way to normal) and protonated C binds to G, to form the triplets T.AT and C+.GC. In this way a homopyrimidine third strand can bind to its complementary sequence of duplex DNA. Triple helices are generally less stable than the duplexes, and are thought to be induced naturally in the genome by supercoiling, as triple helix formation can relieve torsional stress. However, some small molecules can stabilize triple helixes by preferentially binding to them. Many such compounds, like those that preferentially bind quadruplexes, tend to be intercalating agents of larger than usual planar area, with side chains in the correct disposition to bind in one or more of the three grooves of the triple helix. One of the best-studied is the benzo [e]pyridoindole BePI , that binds T.AT triplets. The related antiviral indoloquinoxaline 9-OH-B220  provides a very large stabilization of such triplet species, shifting the triplex-to-duplex equilibrium by up to 50°C . The other major class of triplex stabilizers are the aminoglycosides. One of the most effective is neomycin , which binds preferentially in the larger Watson-Hoogsteen groove rather than one of the regular duplex grooves . Proteins that associate with DNA vary in structure, sequence and structural binding motifs, degree of interaction, regulation, and role in regulating nuclear metabolism. Protein targets for drug design that will be discussed in this review include topoisomerase proteins, DNA methyltransferases, HMGs, TBP and histone deacetylases. Other transcription factors, repair proteins and other important nuclear proteins involved in replication and recombination are also important candidates to consider, but will not be discussed here. Topoisomerase enzymes are involved in resolving topological problems in DNA, such as superhelical tension, that arise during most nuclear activities involving DNA. Topoisomerase I (TOPO I) acts by introducing one break in one strand of the DNA, whereas Topoisomerase II (TOPO II) acts by making a double strand break. 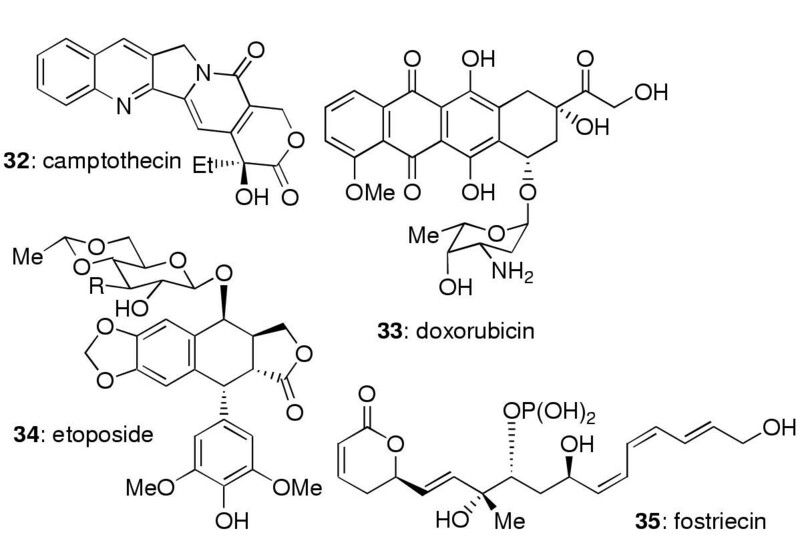 Aside from several intercalating agents such as doxorubicin, TOPO I and II are the targets of numerous drugs, some of which function as poisons and others as competitive inhibitors. The major class of TOPO I poisons is exemplified by camptothecin (CPT) [32, 154], a cytotoxic alkaloid containing an essential six membered lactone ring. This is a natural product, originally isolated from Camptotheca acuminata. It binds to TOPO I in association with DNA and stabilizes the single-stranded break, preventing strand passing through the break and subsequent resealing. Structure-activity studies have lead to the development of a number of closely related compounds that are also used clinically. TOPO II poisons can be classified into two major classes. The DNA intercalators that bind primarily to DNA are exemplified by the anthracycline doxorubicin , while those that bind primarily to the protein can be exemplified by the epipodophyllotoxin etoposide . Both classes of compounds work by formation of a ternary drug/DNA/enzyme complex that inhibits the DNA resealing activity of the enzyme, stabilizing the cleavable complex and resulting in DNA double-strand breaks. Other inhibitors, such as fostriecin  and derivatives, inhibit the catalytic activity of topoisomerase without stabilizing the cleavable complex. Changes in the nuclear environment that result from topoisomerase inhibitors vary. TOPO II is cell-cycle dependent and expression is higher in actively proliferating cells leading to their greater susceptibility[158, 159]. TOPO II inhibitors generally disrupt the cell-cycle during S phase because the increased concentration of DNA double-strand breaks interferes with DNA replication and triggers apoptosis[153, 160]. In the case of CPT, the generation of DNA breaks in addition to the collision of the stabilized cleavable complex with the DNA replication machinery is necessary for cell killing [160–162]. CPT also blocks the elongation step of transcription. Nuclear DNA methylation patterns are often altered in human malignancies. In some cases, the genome-wide degree of methylation is reduced and in certain circumstances may be responsible for abnormal gene activation. In other cases, promoters of certain genes are hypermethylated and this leads to gene silencing . There are at least three enzymes responsible for DNA methylation of CpG dinucleotides (the transfer of methyl groups from S-adenosyl-L-methionine to cytosine to form 5-methylcytosine), DNA methyltransferase (DNMT) 1, DNMT3A, and DNMT 3B. DNMT1 is predominantly responsible for maintaining methylation patterns during replication, whereas DNMT3A and 3B are required for de novo methylation. CpG islands are concentrated regions of CpG dinucleotides generally found in promoter regions[166, 167]. Methylation of these regions in normal cells generally occurs on genes located on the inactivated X chromosome and on selectively silenced alleles[168, 169]. In neoplastic tissue however, methylation can lead to silencing of key tumour suppressor genes. Tumour suppressor and growth inhibitory genes, such as p15INK4b, p16INK4a, and p21WAF1/CIP1, are often silenced in cancer cells by DNA hypermethylation of their promoter regions. Reversing the degree of DNA methylation using azanucleoside DNA methyltransferase inhibitors such as 5-azacytidine  and 5-aza-2'-deoxycytidine  (decitabine) reactivates transcription at previously silenced tumour suppressor promoters. The mechanism by which these azanucleotides act is via incorporation into the cellular DNA and inhibition of DNMT1 via covalent interaction (thioether bond) at C-6 which forces replication to proceed without DNA methylation. Thus far these compounds have shown some success in clinical trials [174–177]. Two alternate strategies that have been employed to inhibit DNMT1 are the use of DNMT1 anti-sense oligonucleotides and the use of hairpin-structured oligonucleotide substrate mimics. Fournel et al. ) demonstrated that use of antisense oligonucleotides led to loss of DNMT1 protein, decrease in methylation at the p16INK4apromoter, and expression of p16INK4aRNA. Although the hairpin mimics effectively inhibit purified DNMT1 in vitro, they have not been able to induce methylation changes in cells. The regulation of chromatin structure and DNA sequence accessibility is the subject of extensive research because they play important roles in governing numerous nuclear activities including transcription, recombination, and replication. The basic nuclear DNA unit is the nucleosome; a 146 bp stretch of nuclear DNA wrapped around an octamer of histone (H) proteins (two each of H2A, H2B, H3 and H4) [180–182]. Arrays of nucleosomes are then folded into higher-order structures such as chromatin fibres. The three known mechanisms influencing chromatin structure are ATP-dependent chromatin remodelling, histone replacement, and covalent modification of either DNA or associated histones. In the last case, modifications include cytosine methylation and histone acetylation, phosphorylation, methylation, ubiquitination, and ADP-ribosylation. The regulation of these mechanisms and their cross-talk in the nucleus affects whether DNA sequences will be accessible for nuclear processes. Active transcription is associated with lysine acetylation of histones and methylation at Lys-9 of H3; whereas, transcriptional repression is associated with deacetylated histones, methylation of Lys-4 of H3 and methylated DNA[180, 181, 183, 184]. The main mechanism by which HDACs repress transcription is likely to be the result of functional linkage between HDACs and DNA methylation via recruitment of HDAC to DNA by methyl binding proteins (for example MeCP2 and MBPs1–4). This in turn inhibits the recruitment transcriptional activators such as SWI/SNF, SAGA, and TBP proteins to the promoter regions preventing gene expression. In addition, the deacetylated histone tails may actively recruit transcriptional silencers. For example in yeast, Sir3 preferentially binds to non-acetylated DNA and associates with Sir2/Sir4 to form a "silencing" complex that spreads heterochromatin formation [180, 183, 186]. Although Sir3 and Sir4 human homologues have not been identified, the potential for preferential binding to non-acetylated DNA is still a feasible mechanism to consider. In addition, it is important to consider that HDACs may act on other molecules, such as specific transcription factors and alter their activation states. There are three major classes of HDACs, although known inhibitors only work on two of the three classes. The HDAC I class is composed of proteins that are homologous to the yeast RPD3 gene; HDAC1,2,3,8, and 11. HDAC class II is subdivided into two; IIA proteins include HDAC4,5,7, and 9, IIB proteins are HDAC 6 and 10 and are characterized by sequence homology to yeast HDAI. Class III proteins are similar to the yeast repressor protein, Sir2, although they have not been extensively characterized in mammals. The HDAC inhibitors of both HDAC I and II classes bind and inhibit HDAC activity, induce acetylation of histones in cells, inhibit tumour cell proliferation in vitro, and several compounds have shown promising results in human xenograft experiments [187–190]. 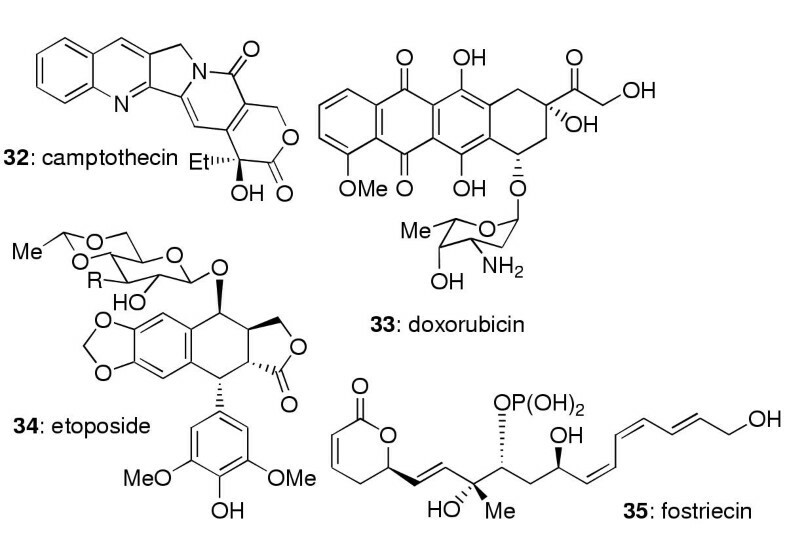 The HDACs are attractive targets for anti-cancer drug design because they are involved in gene silencing similar to the DNA methylase targets mentioned above, and a number of structurally diverse classes of inhibitors are in development. However, only the first two types of HDACs are sensitive to the inhibitors developed thus far. These fall into several structural classes; the short chain fatty acids, the hydroxamic acids, the cyclic tetrapeptides, the benzamides, and the epoxides. A number of these HDAC inhibitors are at various stages of clinical study. Phase I studies with suberoylanilide hydroxamic acid (SAHA)  concluded that it was well tolerated, inhibited the HDAC activity in vivo (in peripheral blood mononuclear cells and in post-therapy tumour biopsy), and has anti-tumour activity in solid (bladder) and haematological tumours. SAHA is in phase II development for treatment of cutaneous T cell lymphoma, peripheral T cell lymphoma, and recurrent or metastatic squamous cell carcinoma of the head and neck. The depsipeptide FR901228 (FK228)  is in trials for a variety of leukemias and lymphomas, and refractory or progressive small cell and non-small cell lung cancer. The cellular response to HDAC inhibitors is becoming better characterized. For example, SAHA binds directly to the HDAC catalytic site, inhibits enzyme activity, inhibits cellular proliferation and promotes an apoptotic cellular response [193–195]. Oligonucleotide microarray analysis of multiple myeloma cells treated with SAHA demonstrated that commitment to apoptosis is associated with suppression of genes involved in promoting cell growth and survival, drug resistance, cell cycle control, DNA replication and repair, and proteosome function. Combination therapy using HDAC inhibitors and other agents such as DNA methylase inhibitors and heat shock protein 90 (HSP90) antagonists have demonstrated a synergistic effect on cellular responses such as activation of gene expression and induction of apoptosis [197–202]. For example, using depsipeptide and 5-aza-2'-deoxycytidine treatment of breast cancer cell lines, Primeau et al. demonstrated synergistic anti-neoplastic activity and the activation of mapsin and gelsolin gene expression, two metastatic tumour suppressor genes that are silenced by epigenetic mechanisms in breast cancer lines. In the study by Rahmini et al, co-administration of the HSP90 antagonist 17-allylamino-17-demethoxy-geldanamycin (17-AAG) and SAHA induced synergistic induction of mitochondrial damage, caspase activation (-3 and -8), and apoptosis in several different human leukaemia cell lines. These investigators found that co-administration of 17-AAG with SAHA blocked the SAHA mediated induction of the cyclin-dependent kinase inhibitor, p21WAF1/CIP1, and that this novel finding might explain why the combination treatment was more effective. When cells were forced to express p21WAF1/CIP1, the combination treatment was far less effective. In many cases the interaction of small molecules with DNA results in a distortion in the normal DNA structure. This distortion may result in the inhibition or induction of protein binding at or in the vicinity of the perturbation. The outcomes of the alteration vary and may be more or less dependent on the primary nucleotide sequence. In this subsection, TBP and HMG proteins are discussed. Cis-diamminedichloroplatinum  (cisplatin) is a DNA alkylator that forms predominantly intrastrand crosslinks by binding to the N7 nitrogen of adjacent guanidine residues or guanidine-adenine residues. Cisplatin binding causes a structural distortion in the DNA (bend of 40–60°, and twist of 25–32°) as revealed by crystallography and NMR spectroscopy. The cisplatin-distorted DNA activates binding of a number of nuclear proteins such as TBP, p53, HMG1, and H1[23, 24, 204–208]. In the case of TBP, binding is somewhat sequence dependent, although the preferred sequence is not the TBP consensus sequence. It has been suggested that the affinity of TBP for cisplatin-modified DNA is because the DNA distortion caused by cisplatin crosslinking is similar to TATA box DNA structure when bound to TBP. The effects of cisplatin treatment include inhibition of DNA synthesis and RNA transcription, effects on the cell cycle, and activation of apoptosis. The binding of HMG1 to the cisplatin adduct has been shown to block translesion DNA synthesis in vitro . Studies by He et al. suggest that the interaction of HMG1 and the DNA adduct increases the cytotoxic potential of cisplatin. In these experiments, breast cancer cells were induced to over express HMG1 by pre-treatment with estrogen and were shown to be more sensitive to cisplatin than uninduced cells. This sensitization could be because DNA replication is halted either directly or because DNA adducts are no longer effectively recognized by cellular nucleotide excision repair machinery[212, 213]. While cisplatin has been effective in treating a number of different cancer types including testicular cancer, ovarian cancer, head and neck cancer, the onset of resistance has limited its use[207, 214]. In general, the degree of cytotoxicity of cisplatin is correlated with the formation and duration of DNA adducts, therefore processes that interfere with these will contribute to the development of resistance. The pathways that have been implicated in the development of resistance to cisplatin include pharmacologic-based mechanisms (reduced drug uptake and increased drug inactivation) as well as mechanisms that inhibit apoptotic signalling. Some of these anti-apoptotic mechanisms include increased repair of the cisplatin-DNA adducts and/or masking of the DNA damage by creating unnatural protein binding sites and/or inducing binding of proteins such as HMG1, and H1 [1, 14, 203, 215]. Additionally, many studies point to the DNA adduct masking (repair shielding) as a process strongly involved in potentiating cytotoxicity. The nucleus offers a variety of potential targets for anti-cancer drug design. Historically, most nucleus-specific agents have been designed to interact with DNA, causing extensive DNA damage leading to induction of cell death. The new strategy in drug design is to tailor the drug to the specific cancer diagnosed in an attempt to provide the most suitable treatment with the least deleterious side effects to the patient. The outcomes of this approach include drugs targeting specific signalling molecules such as BCR/ABL in the case of Glivec and chronic myelogenous leukemia. In addition to reduced toxicity, using defined targets in combination therapy may help to reduce the development of drug resistance. Targeting specific key molecules in the nuclear environment, such as chromatin-associated proteins, proteins involved in replication, recombination, repair, and transcription is another level at which to disrupt requisite cancer-promoting pathways. The HDAC inhibitors in combination with the DMNTs shows promise of specifically activating genes that are important tumour suppressors silenced by hypermethylation more effectively than when used as single agents. Many topoisomerase targeted compounds have been successfully used in the clinic thus far, and certainly set the stage for the targeting of other proteins involved in DNA replication and recombination including some important helicases and repair proteins. The DNA-associated HMG proteins are another useful target and set a precedent for examining other DNA distortion- recognizing proteins and proteins that bind to specific DNA regions such as MARs. Alternatively, as we understand more about genomic DNA itself, specific sequences and regions, secondary structures, nucleosome formation and higher-order compaction, and interactions with the nuclear matrix and associated proteins, drugs have been and will continue to be designed to disrupt these processes specifically. It is hoped that this approach will provide the same benefits as outlined above for targeting the associated proteins, but may be broader by interfering with multiple processes that occur at the affected locations. An exciting area of research being developed is conjugation of compounds capable of recognizing certain sequences with compounds that exert another function. Examples of this are the polyamide-chlorambucil and CBI conjugates[93, 94] that connect highly specific DNA sequence recognition with DNA alkylation and mostly work by inhibiting specific gene expression, but this approach could be extended to facilitate targeting of the DNMT and HDAC inhibitors, for instance, to specific tumour suppressor promoters to activate transcription. Lastly, another important area of research is focused on taking these small molecules and developing them into tumour-specific pro-drugs as another means of reducing deleterious side effects to the patient. The authors would like to thank the Auckland Cancer Society. S.M. Nelson is funded by the Foundation for Research Science and Technology, NZST Fellowship UOAX0247.